Here's an anniversary worth celebrating. The indispensable listings guide, Jazz in London, is forty years old this summer. We first asked the driving force behind the publication, MARY GREIG, to tell us her story. We then invited a few people to show Mary their appreciation for her irreplaceable contribution to the capital's musical life. The story of Jazz In London started in 1971, forty years ago . . . at a time when contemporary Jazz was even more of a minority music than it is today. At that time, there were only two major clubs ( Ronnie Scott’s and the 100 Club ) although, interestingly, the jazz audience could support three specialist Jazz record shops within walking distance of each other (Dobell’s, Asman’s and Collet’s). It was a very intimate, small sub-culture in Soho in those days, and it would be no surprise to find yourself drinking alongside the great American musicians who were performing at Ronnie Scott’s at the time, or alongside luminaries of the art world like Francis Bacon. Jazz in London was started by John Jack, a record producer and champion of the contemporary end of Jazz music. He lived, as he does now, in Charing Cross Road, and ranthe jazz sessions at Ronnie’s Old Place in Gerrard Street, which provided a showcase for many of the young players who have since gained international recognition:- John Surman, Mike Osborne, Mike Westbrook and many others. This was pre Time Out London, and information on where to hear Jazz was mainly word of mouth and posters, so John started to produce a folded A4 sheet called Jazz in London, with a strapline of “Mainly The Newer Trends In The Music”. The early editions listed around a dozen venues, two of which were weekly venues run by Jazz Centre Society, the forerunner to Jazz Services. In 1973 John took on the full-time commitment of Cadillac Records, so Jazz In London was passed over to me. I was very involved in the jazz scene and was active in running clubs for Jazz Centre Society, and working in Collet’s Jazz Record Shop. I knew a lot about the Jazz scene, but nothing about how to produce a publication. In this pre-technology era, I learned to use cut-and-paste typed text and Letraset to compose the layout, pasting it all out on boards and taking the boards to the printer. Some of the early issues look extremely clunky now, but nobody seemed to mind at the time. 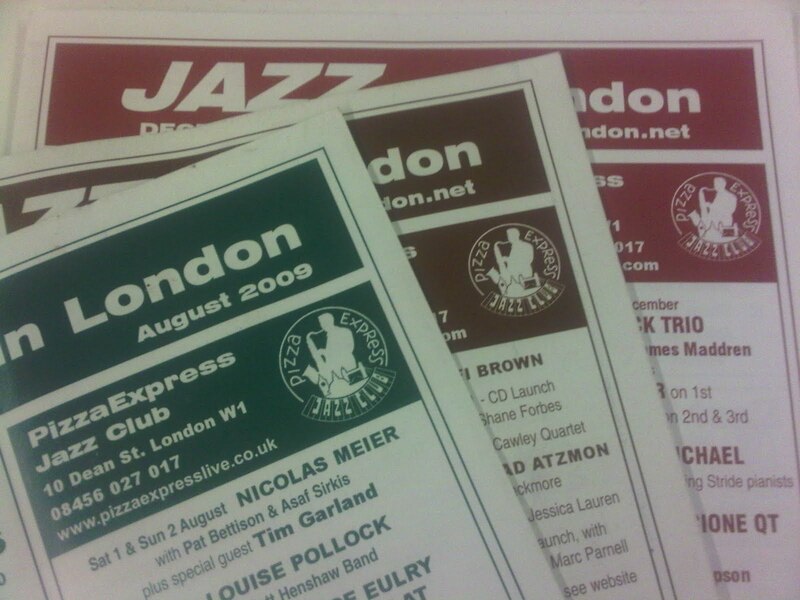 I’ve continued to produce Jazz In London single-handedly since then, and over that time it hasgrown from a single A4 sheet to the multi-page publication that it is today. Although a bit of a technophobe, I’ve managed to get to grips with the fundamentals of desk-top publishing, so these days it gets sent to the printer down the phone line, rather than on bits of card! In recent years I’ve been immensely aided by Mick Sexton, who since 2003 has been the person who puts the publication online, (LINK) and also helps me with the distribution. I think the extraordinary longevity of Jazz in London is essentially down to it having been a one-person operation, and being very pro-active about getting information. Also, I’ve always kept to the simple format of providing information, rather than branching into editorial content. And by keeping it simple, costs are contained and therefore advertising is very affordable to small promoters. It reflects a genuine network of promoters, performers, punters etc. who all contribute in their separate ways to a healthy scene. So that now, something that started as a labour of love seems to have become an important underpinning of the London Jazz community, and I suppose I’m rather proud of that. The Jazz scene has, of course, now changed beyond recognition, with the huge expansion ofwonderful young talent and the recognition of the music conservatoires that jazz is a music worthy of their curriculum. These days I find myself typing the names of many musicians that I’ve never even heard, whereas 35 years ago, they were all my mates! I don't know where we'd all be without Mary! I've known her for almost 20 years, and yet we've never met! However, we talk regularly on the phone and she has always shown a great interest in the gig at Boaters and been incredibly supportive over the years. The London jazz scene owes Mary a huge debt of gratitutde as without her tireless efforts to produce accurate and informative listings there would be no platform for the small jazz gig to survive and thrive. She deserves a medal for her incredible work. Mary, you have been steadfast and totally reliable in providing the best unbiased, accurate and most comprehensive listings publication of the contemporary jazz scene in London. It also rivals the jazz listings of other major world cities including New York, and to have single-handedly produced a publication at this level over an impressive 40 years deserves the utmost respect of the jazz community, from both punters and performers alike. You and JiL have been an integral part of the scene for as long as I can remember and you have been very much a friend of the music and its practitioners, a consistent supporter of ‘grassroots’ venues, Ronnie’s and for a while, a welcoming sight behind the counter at Ray’s Jazz Shop during your earlier years in London. I raise a glass or two in your honour, and look forward to seeing you soon – A big thanks Mary, and I am sure, from many others too! We at Ronnie’s are grateful and fully appreciate the not inconsiderable effort that goes into compiling the best jazz listings publication that London has to offer. Thanks for your unflagging support through the years. May we congratulate you on your anniversary and the singularly high quality of ‘Jazz in London’! Like many other musicians, I know how much Mary’s painstaking work over four decades has contributed to bring audiences to gigs in London, week in week out. Thank you for keeping all of us in touch! Congratulations on this amazing achievement Mary! Thank you for your continued hard work, the live jazz scene really wouldn't be the same without you! Congratulations Mary. I have been getting Jazz in London ever since I was a teenager in the 1970's and it has always been the best resource to find out where to hear the music live. This is such an important part of the London Jazz scene. Thank you for all your dedication to the music. It was really nice to read the history of it as well. Because of you Mary I found an old music pal from the 50s. Ray Coussins played a Sunday night at the Pizza on the Park (RIP) and through JIL I met up with him again. Thanks for your continuing efforts and devotion. The Wenlock Arms Hoxton every 4th Saturday in the month. Dino Coccia Trio featuring guest pianists. Edwardian Pub good atmosphere & great real Ale. As a young man arriving in this city from far off India my fledgling interest in jazz was 'democratised', so to speak, by my ability to access this booklet. I had little money to spare and did not think of myself as fashionable enough to go to the fancier Soho clubs - Jazz in London sorted all this out and told me exactly which basement jams I could slink into and hide myself! Thank you Mary Greig and Jazz in London. I live in the Southampton area and have relied on 'Jazz in London' for 25 years to keep in touch and to help me decide which gigs to travel for. Will miss it greatly now but many thanks to Mary for her years of dedication. I've relied on Jazz in London for gig information for as long as I can remember. Mary has done a fantastic job. But what are we going to do without it?! There must be thousands of jazz fans and musicians who depend on Jazz in London. Huge thanks to Mary Greig for providing this remarkable service. The existing frontpage mentions a new website. Anyone know how this is getting on? Another fan who has benefited from JIL over the years - I could tell it was unique and special but hearing the full story really pressed it home. Thank you, from countless thousands.